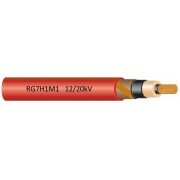 Conductor : red copper, rigid, class 2. Inner sheath : semi-conducting material. Outer layer : semi-conducting layer, special high module HEPR. Shield : red copper wire. Outer sheath : thermoplastic sheath in M1 quality, HFFR.